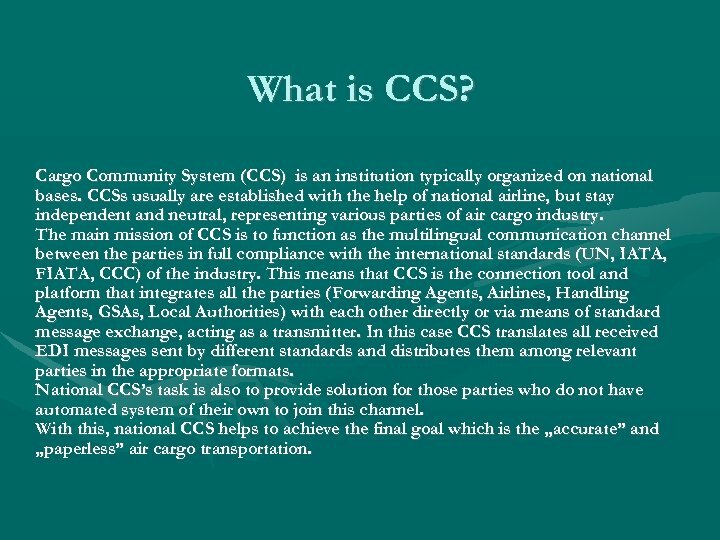 What is CCS? 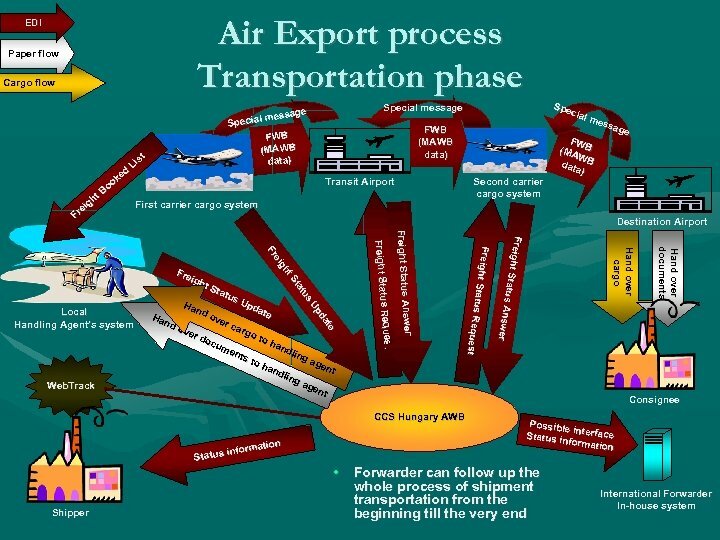 Cargo Community System (CCS) is an institution typically organized on national bases. 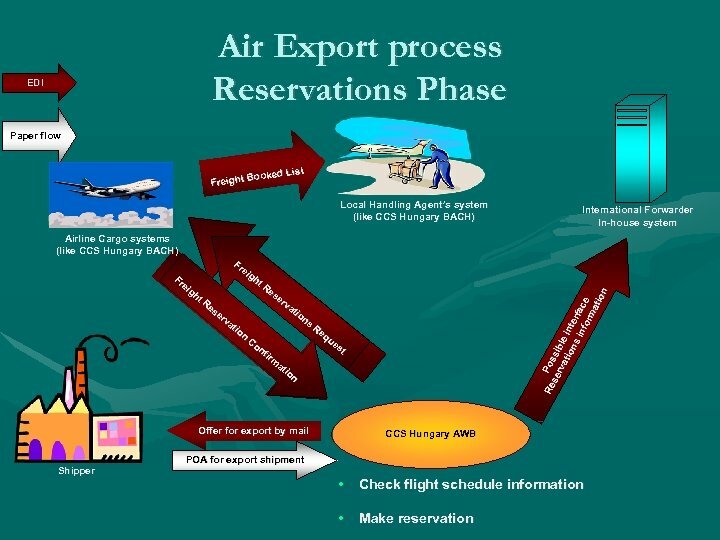 CCSs usually are established with the help of national airline, but stay independent and neutral, representing various parties of air cargo industry. 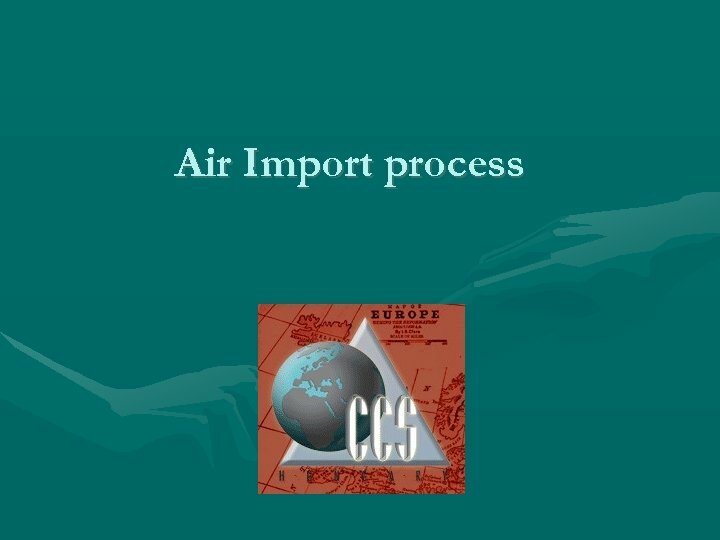 The main mission of CCS is to function as the multilingual communication channel between the parties in full compliance with the international standards (UN, IATA, FIATA, CCC) of the industry. 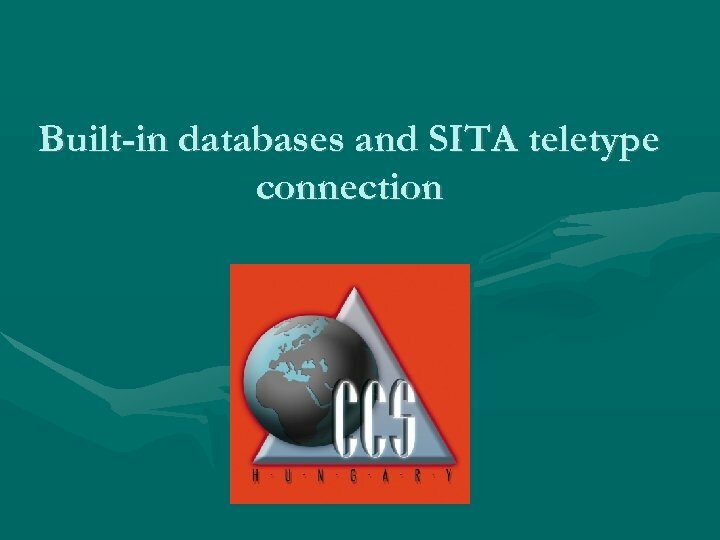 This means that CCS is the connection tool and platform that integrates all the parties (Forwarding Agents, Airlines, Handling Agents, GSAs, Local Authorities) with each other directly or via means of standard message exchange, acting as a transmitter. 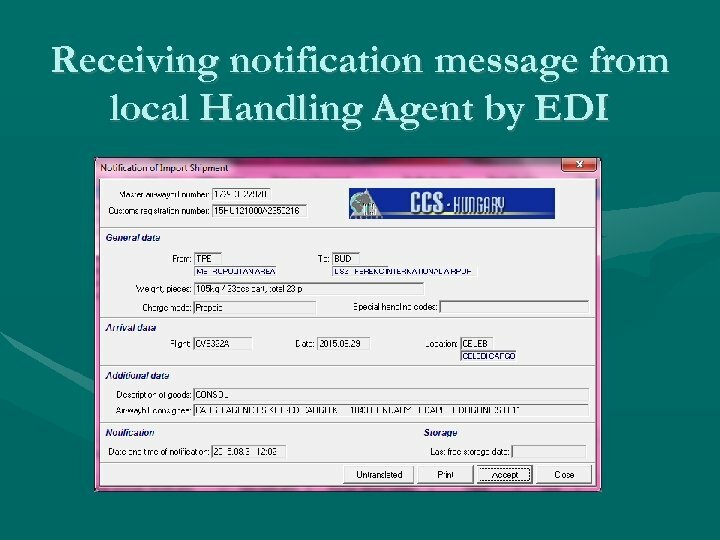 In this case CCS translates all received EDI messages sent by different standards and distributes them among relevant parties in the appropriate formats. 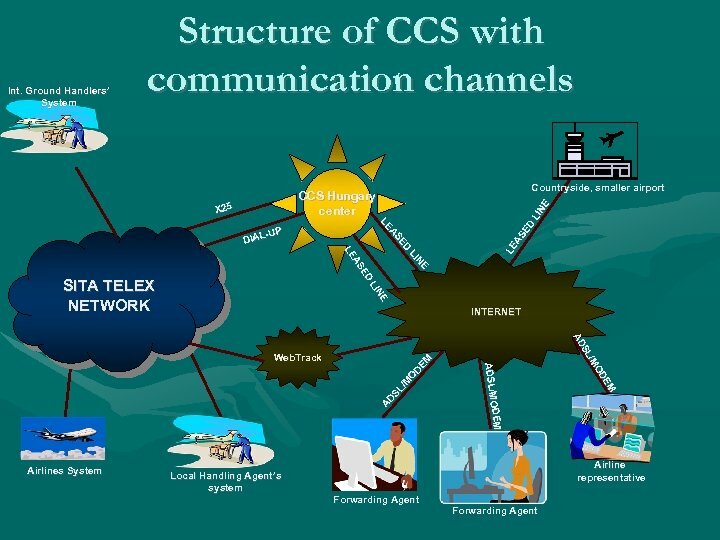 National CCS’s task is also to provide solution for those parties who do not have automated system of their own to join this channel. 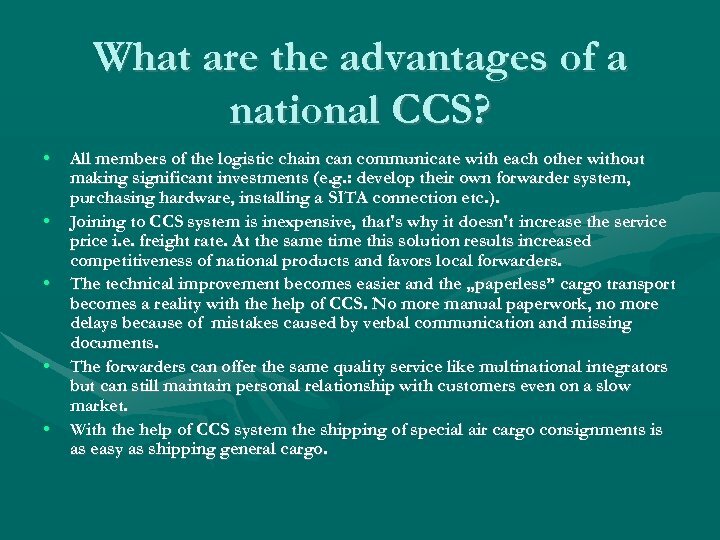 With this, national CCS helps to achieve the final goal which is the „accurate” and „paperless” air cargo transportation. What are the advantages of a national CCS? • • • All members of the logistic chain can communicate with each other without making significant investments (e. g. : develop their own forwarder system, purchasing hardware, installing a SITA connection etc. ). Joining to CCS system is inexpensive, that's why it doesn't increase the service price i. e. freight rate. At the same time this solution results increased competitiveness of national products and favors local forwarders. The technical improvement becomes easier and the „paperless” cargo transport becomes a reality with the help of CCS. No more manual paperwork, no more delays because of mistakes caused by verbal communication and missing documents. 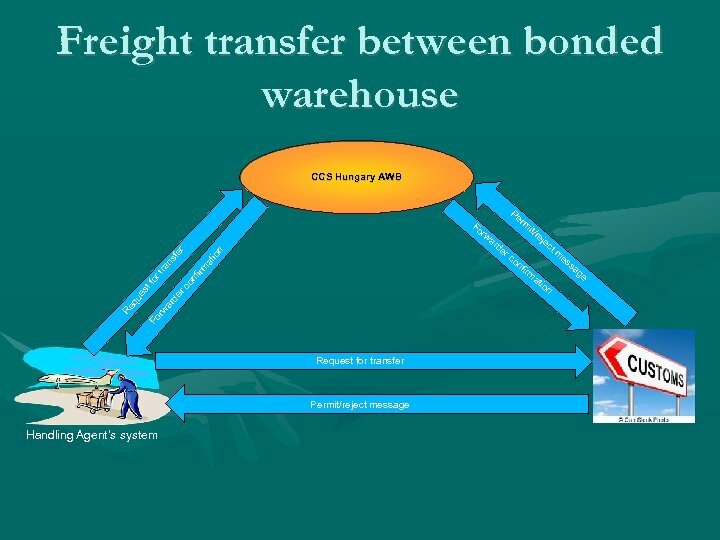 The forwarders can offer the same quality service like multinational integrators but can still maintain personal relationship with customers even on a slow market. 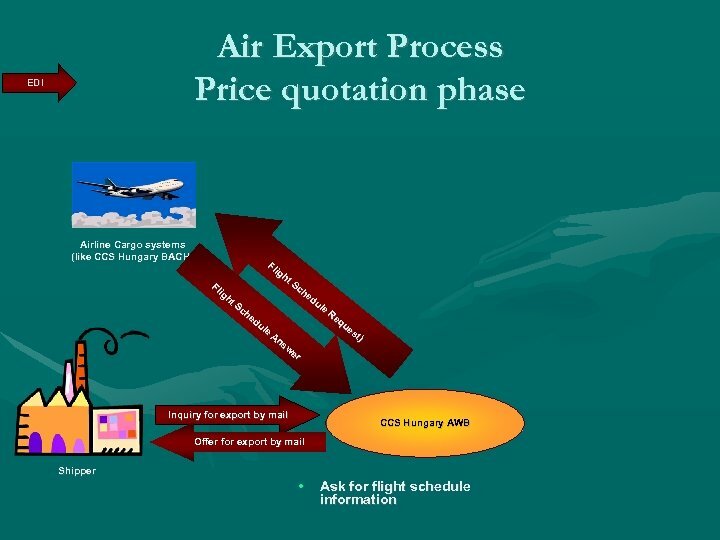 With the help of CCS system the shipping of special air cargo consignments is as easy as shipping general cargo. Who are we? 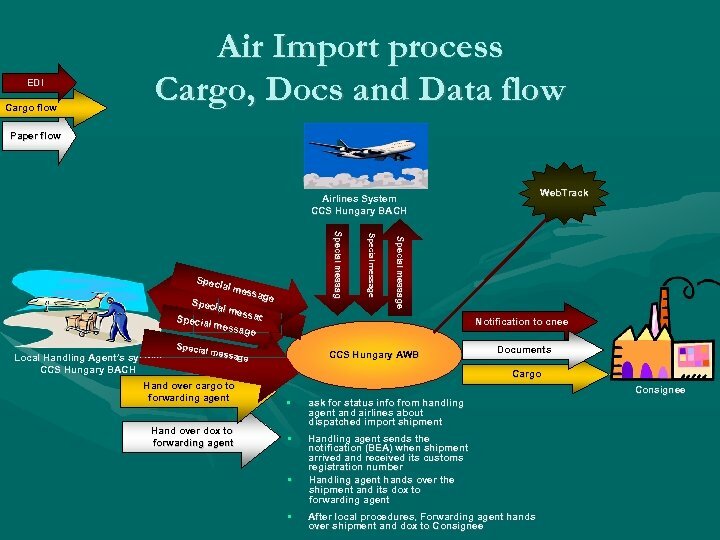 The Cargo Community System Hungary established by three enthusiastic young man in 1993 Ltd. was primarily to set up the Cargo Community System of Hungary to provide direct electronic communications between the systems of air forwarders and the airlines. After two years of software specification and development, we started our service at our first partner successfully. 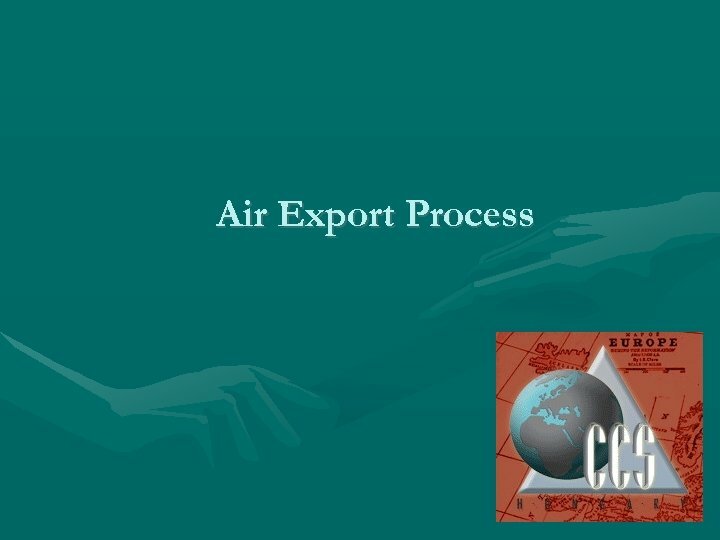 From that time the number of our partners and their workstations is continuously rising up, thanks to our leading product, CCS Hungary Air Forwarder system and the provided additional services. Nowadays the CCS Hungary AWB is working on more than a hundred workstations all over the country. 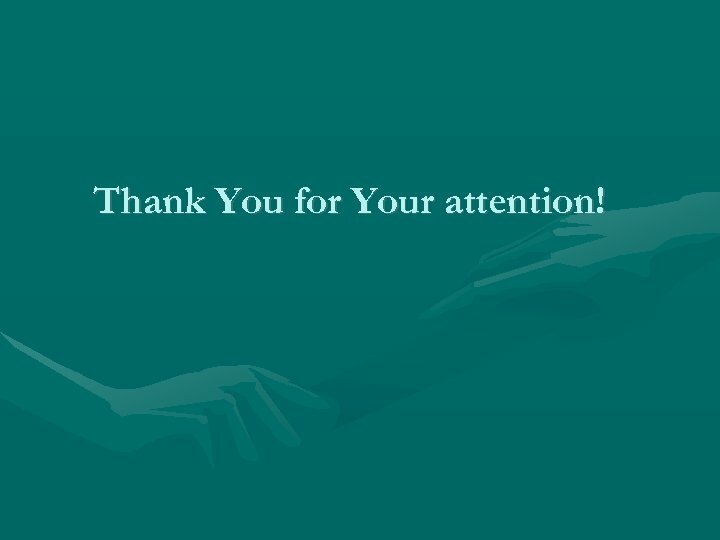 During these years the portfolio of our company has been extended. 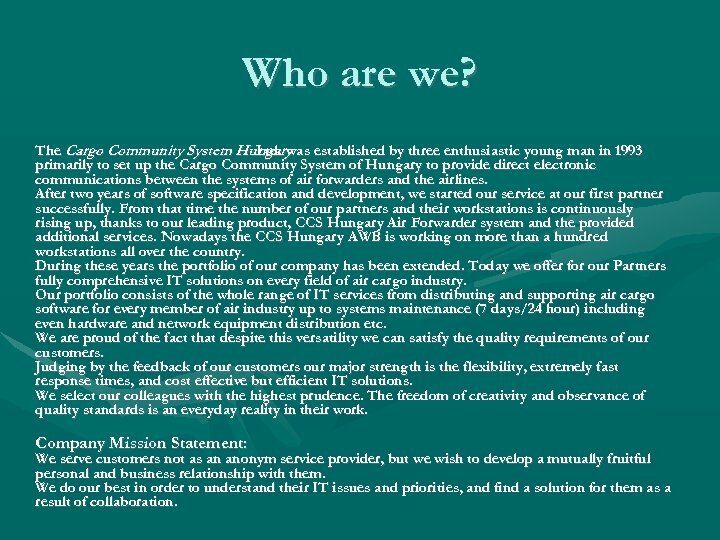 Today we offer for our Partners fully comprehensive IT solutions on every field of air cargo industry. Our portfolio consists of the whole range of IT services from distributing and supporting air cargo software for every member of air industry up to systems maintenance (7 days/24 hour) including even hardware and network equipment distribution etc. We are proud of the fact that despite this versatility we can satisfy the quality requirements of our customers. Judging by the feedback of our customers our major strength is the flexibility, extremely fast response times, and cost effective but efficient IT solutions. We select our colleagues with the highest prudence. The freedom of creativity and observance of quality standards is an everyday reality in their work. Company Mission Statement: We serve customers not as an anonym service provider, but we wish to develop a mutually fruitful personal and business relationship with them. We do our best in order to understand their IT issues and priorities, and find a solution for them as a result of collaboration. What advantages does CCS Hungary offer for you? • A ‘ready to use’ solution to speed up logistics movements. Customer can expect economic growth by faster and a more accurate forwarding of goods. • Competitive advantage for the national forwarders, for the national airports and airlines. 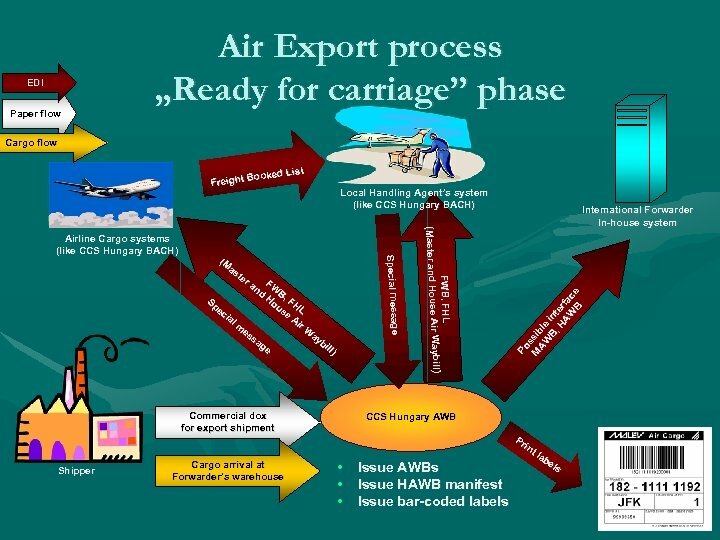 • A tool to secure the air cargo market to avoid unwanted control by others. • A tool to standardize the forwarder activities. 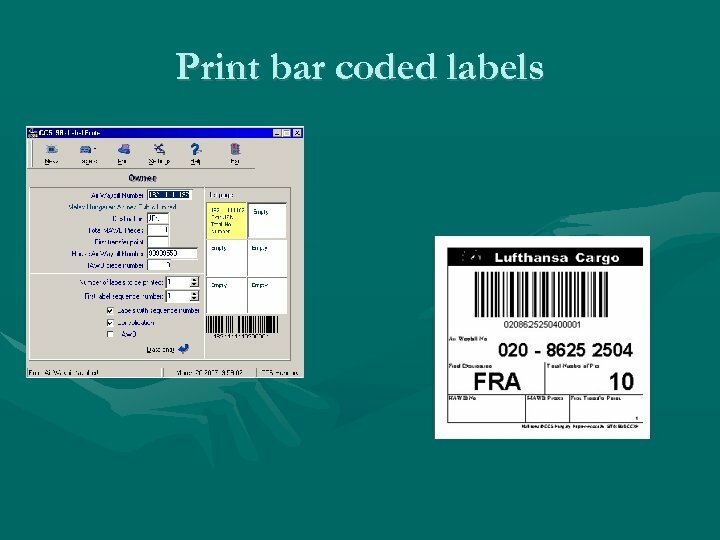 • The right way to achieve ‘paperless cargo’ according to the latest IATA recommendations (e. g. : IATA e-freight). • A solid platform to introduce bar-coded identification. • Know-how, intelligence that comes with the system both for all users. • Easy to tailor make to perfectly meet Your national requirements. • A possibility for authorities to interface and control. 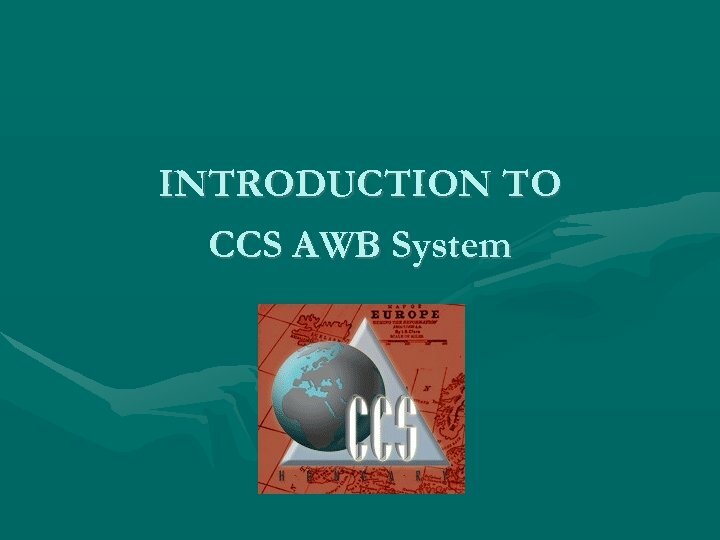 Main functions and advantages of CCS Hungary AWB • • • The software is designed for network use, there is one database, no double entry, all the user can see the same information. 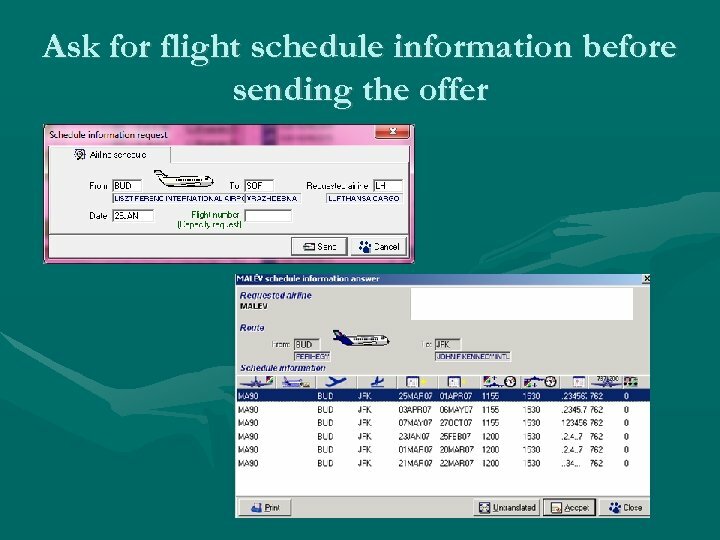 Up to minute fresh schedule information can be obtained from airline systems directly. 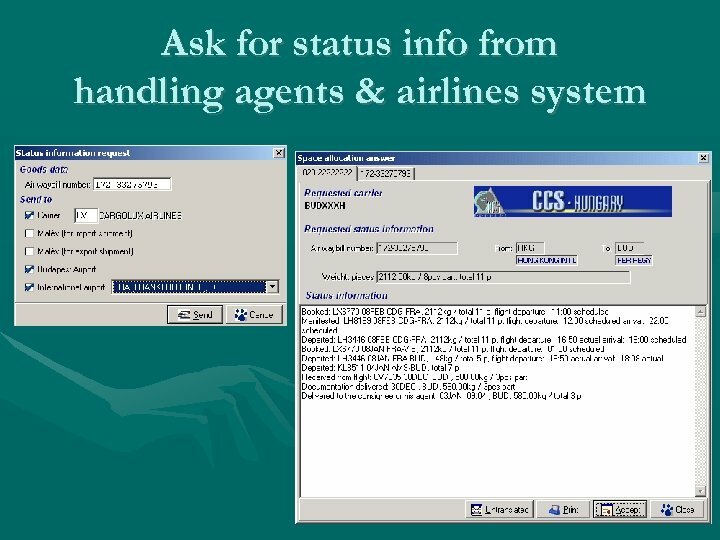 You can make/modify/cancel cargo reservations computer-to-computer in partner airlines systems. Less manual work (phoning, mailing etc. ) to make a reservation. After the airline's office closed you can still make reservations. 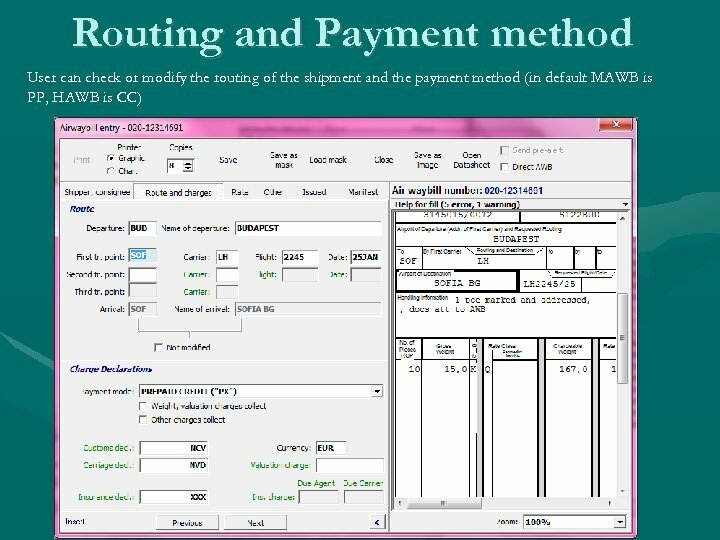 The system helps you to make IATA standard master (MAWB) and house (HAWB) air waybills with automatic/manual/ULD/as agreed rating. Full functional autorating and autopricing are included. 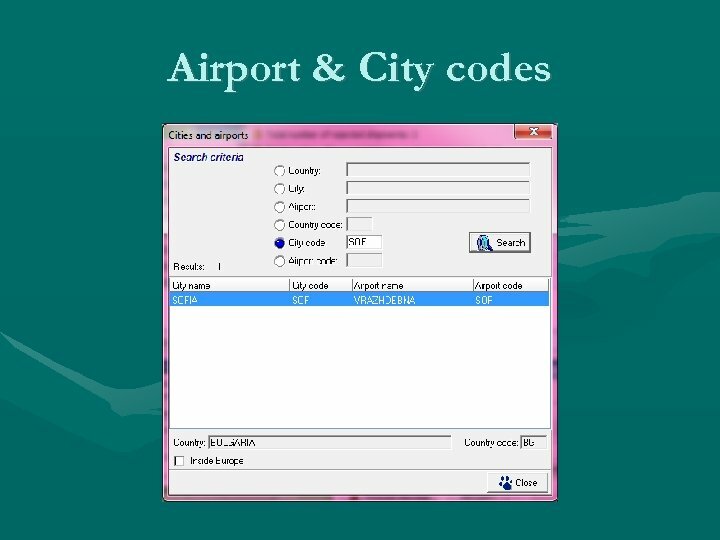 You can save air waybill masks and use them later to issue similar air waybills quicker. 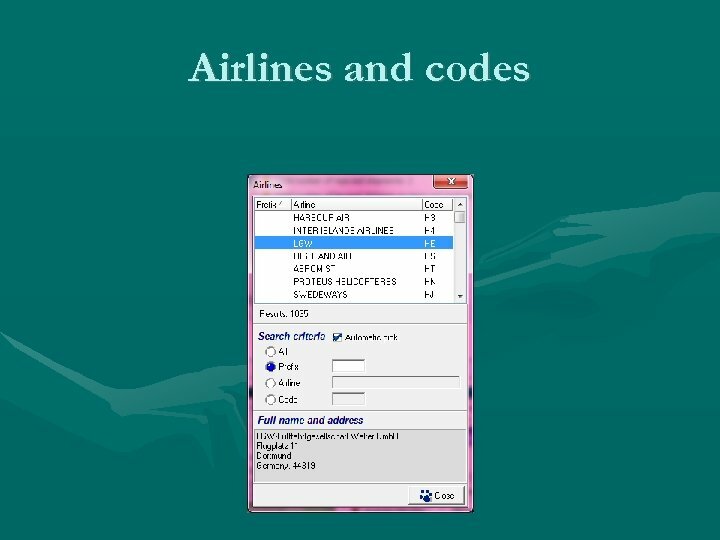 You can print/reprint AWBs with matrix or laser printer You can send FWB (Master Air waybill data), FHL (House Air waybill IATA data) messages electronically to airlines and handling agents. 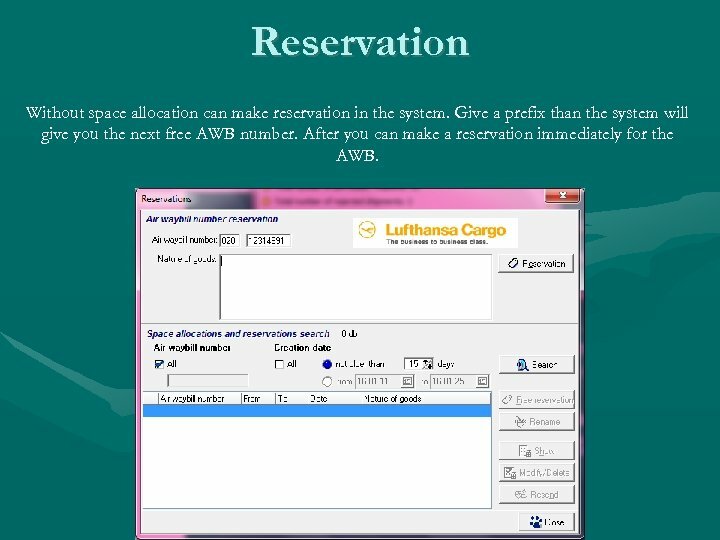 You can avoid the high cost charged by airline for manual entry of MAWB and HAWB into their system. Also at handling agents you may have a shorter flight closing time if you send previously the data of your shipments. To send pre-alerts AWBs can be saved as a picture and attached to an e-mail. 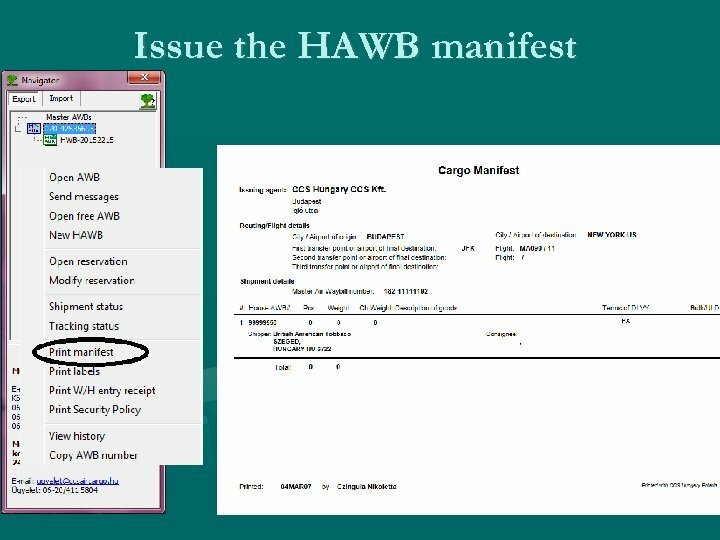 You can print a HAWB manifest with FHL sending control. 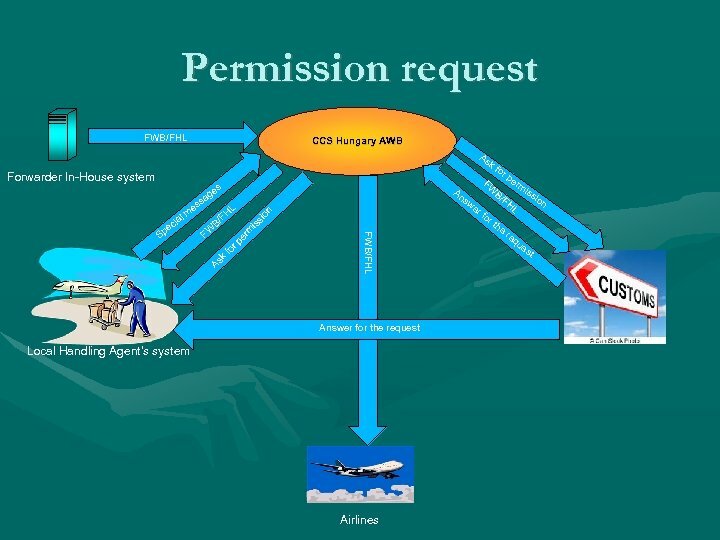 From the system anyone can issue a IATA standard full MAWB or a HAWB within 1 minutes. Main menu of CCS Hungary AWB Similar to every software, users have to log-in to CCS with entering their user name and password. 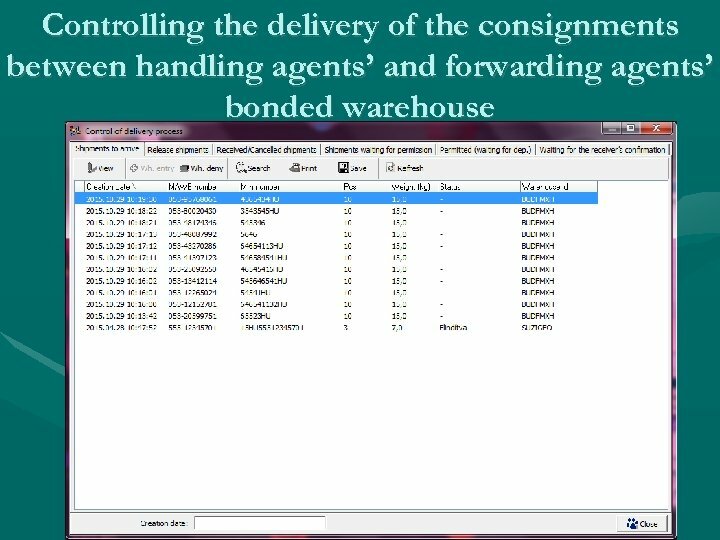 This method is for protecting Forwarding Agents against stealing business information about their shipments by the competitors. Every taken step is recorded in the history with date, time, user name and transaction details. Notices • Help for the users with information to solve problem • Real-time, creditable, valid information from the system • To get the information you need: just a „click” to the warning symbol and the adequate window pop-up helps to handle the problem as soon as possible. Customer data are stored in customer database. 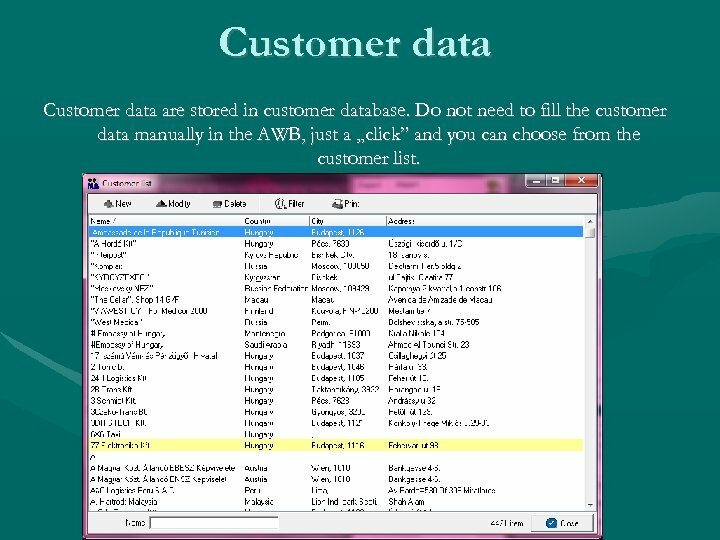 Do not need to fill the customer data manually in the AWB, just a „click” and you can choose from the customer list. 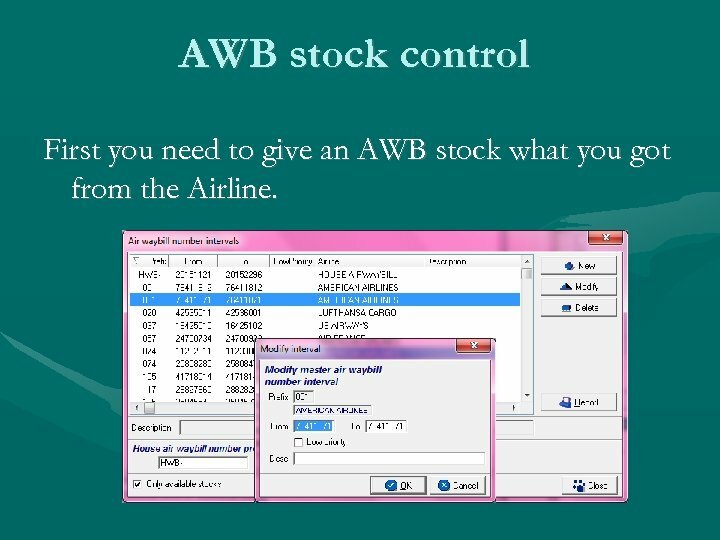 AWB stock control First you need to give an AWB stock what you got from the Airline. Reservation Without space allocation can make reservation in the system. Give a prefix than the system will give you the next free AWB number. After you can make a reservation immediately for the AWB. 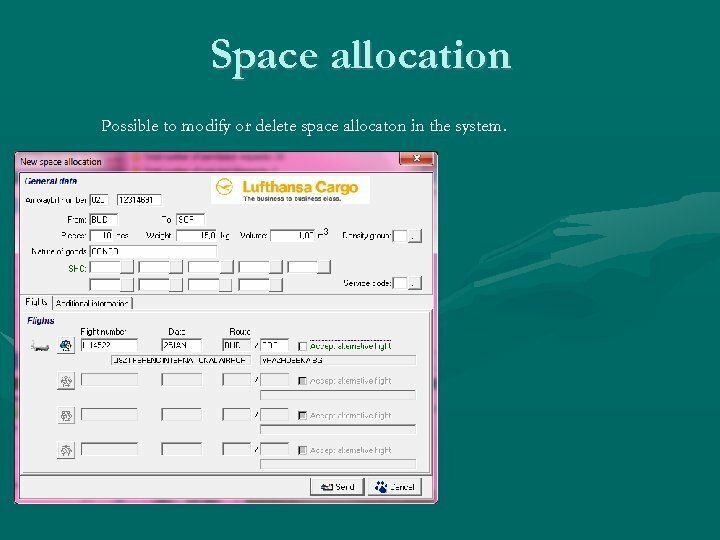 Space allocation Possible to modify or delete space allocaton in the system. 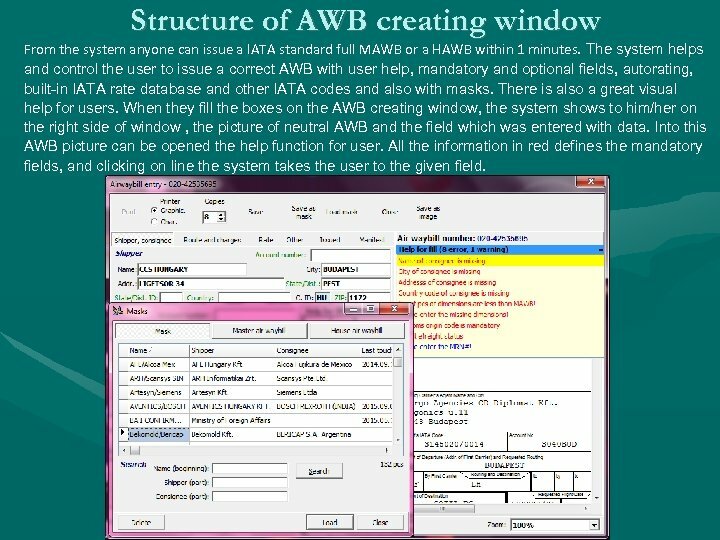 Structure of AWB creating window From the system anyone can issue a IATA standard full MAWB or a HAWB within 1 minutes. 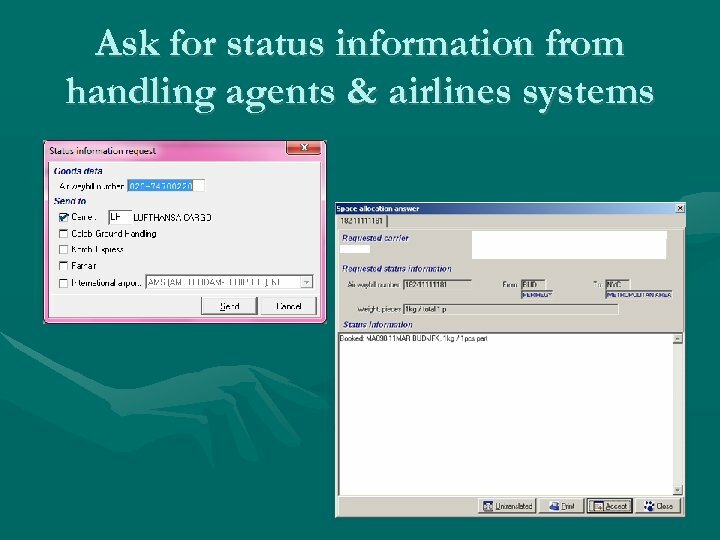 The system helps and control the user to issue a correct AWB with user help, mandatory and optional fields, autorating, built-in IATA rate database and other IATA codes and also with masks. There is also a great visual help for users. 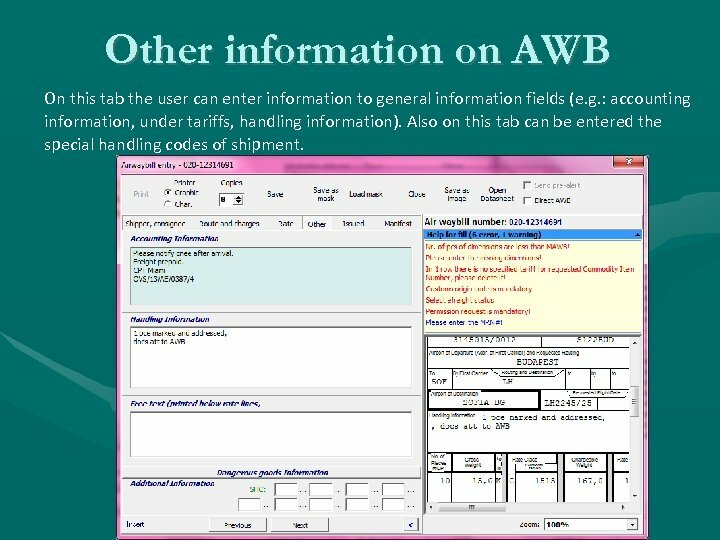 When they fill the boxes on the AWB creating window, the system shows to him/her on the right side of window , the picture of neutral AWB and the field which was entered with data. Into this AWB picture can be opened the help function for user. All the information in red defines the mandatory fields, and clicking on line the system takes the user to the given field. 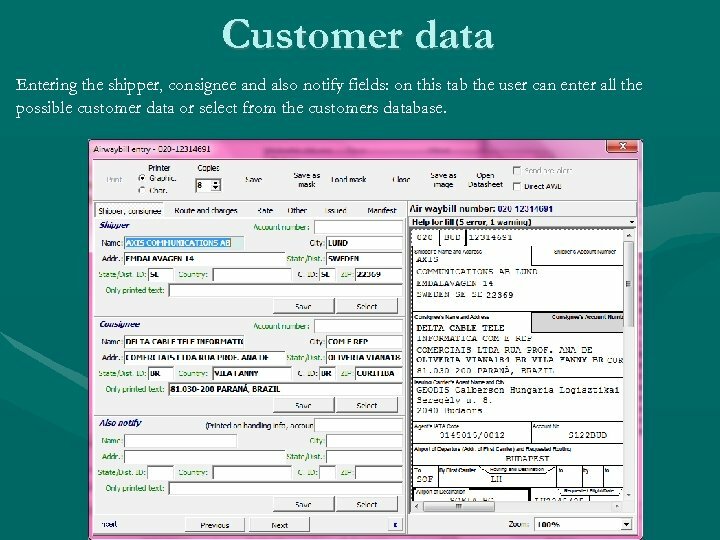 Customer data Entering the shipper, consignee and also notify fields: on this tab the user can enter all the possible customer data or select from the customers database. 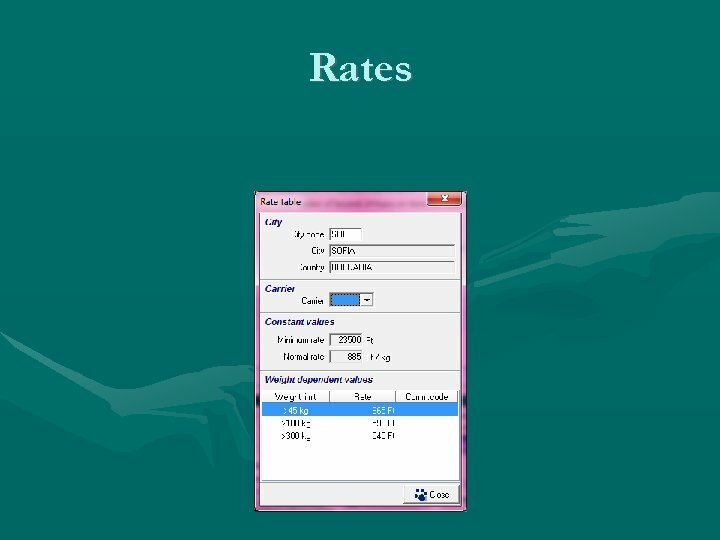 Autorating (rates & other charges) When user enters the weight and pieces of shipment the system automatically calculates the freight cost by using IATA rates to the given destination and airlines. On this tab also there is the possibility for the ULD and RCP rating. The user can also choose the necessary corates or surcharges from the built-in database. 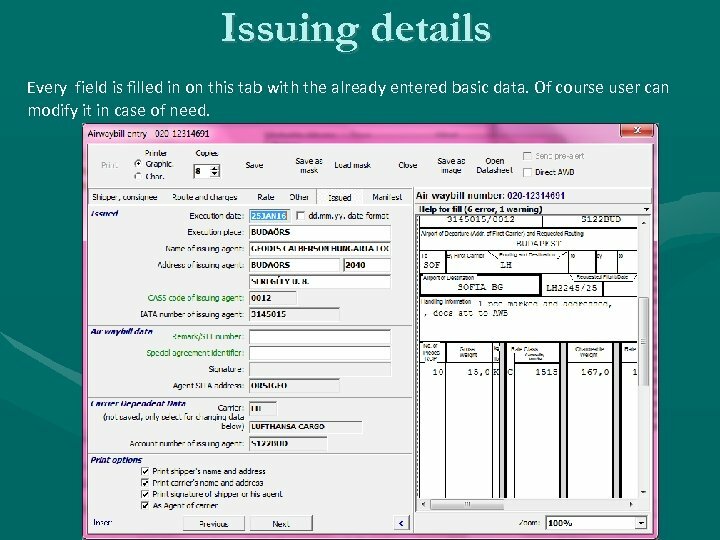 The chargeable weight can be calculated and entered by the system after the user entered the dimensions. 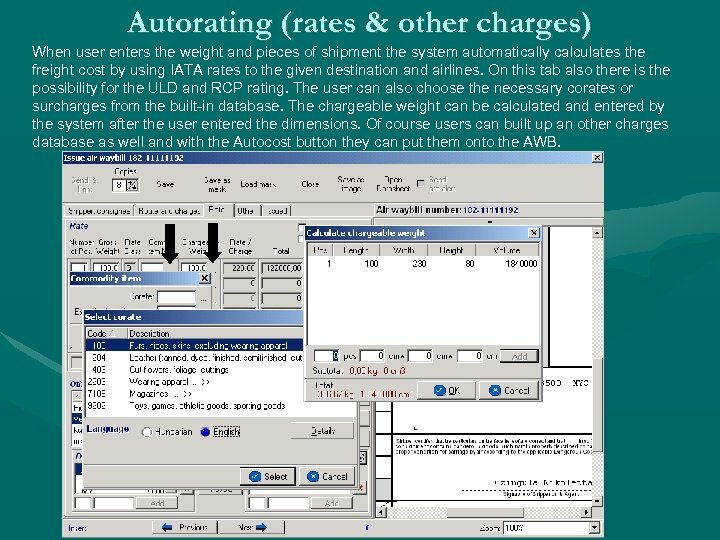 Of course users can built up an other charges database as well and with the Autocost button they can put them onto the AWB. 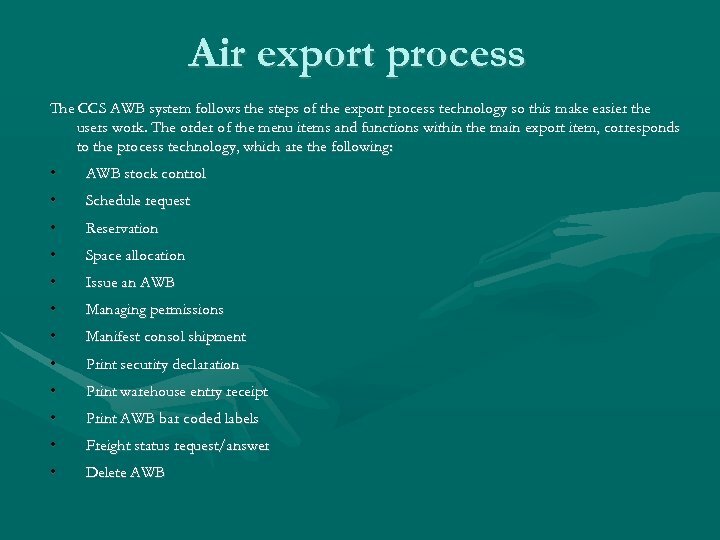 Other information on AWB On this tab the user can enter information to general information fields (e. g. : accounting information, under tariffs, handling information). 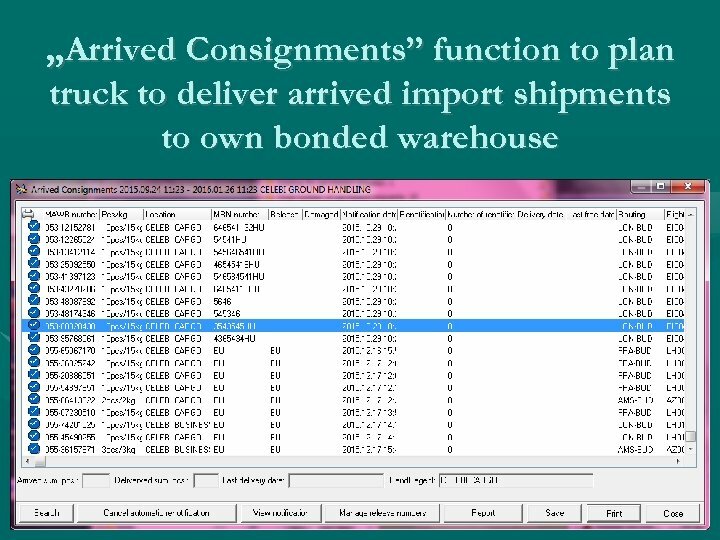 Also on this tab can be entered the special handling codes of shipment. Issuing details Every field is filled in on this tab with the already entered basic data. Of course user can modify it in case of need. 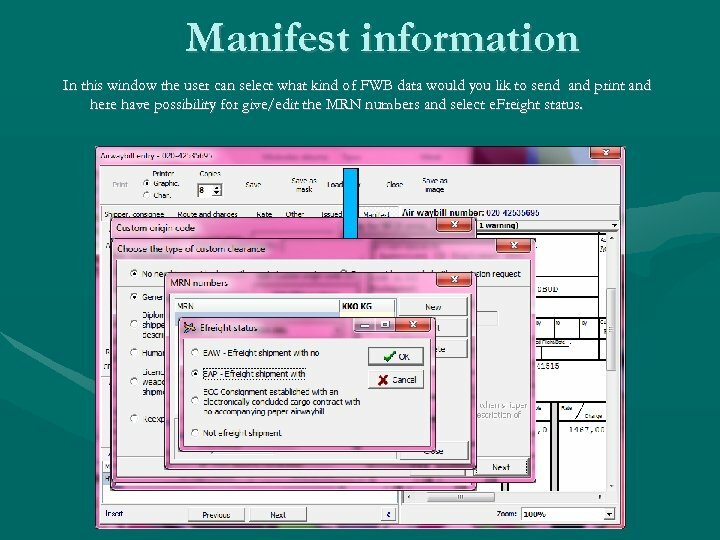 Manifest information In this window the user can select what kind of FWB data would you lik to send and print and here have possibility for give/edit the MRN numbers and select e. Freight status. 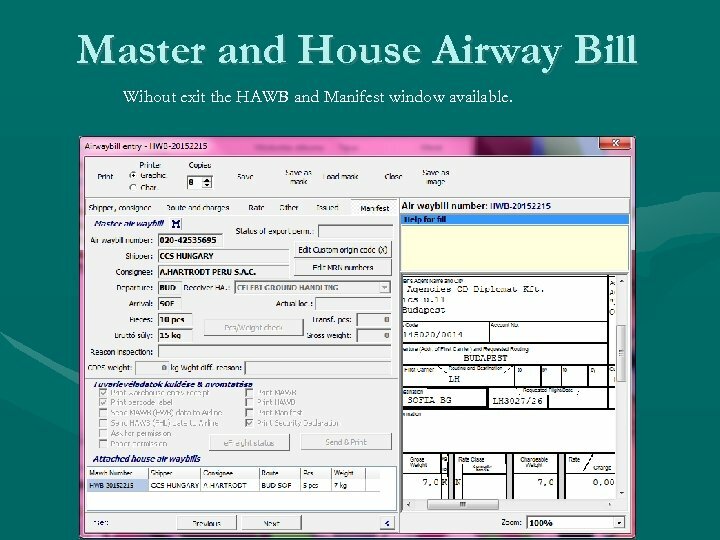 Master and House Airway Bill Wihout exit the HAWB and Manifest window available. 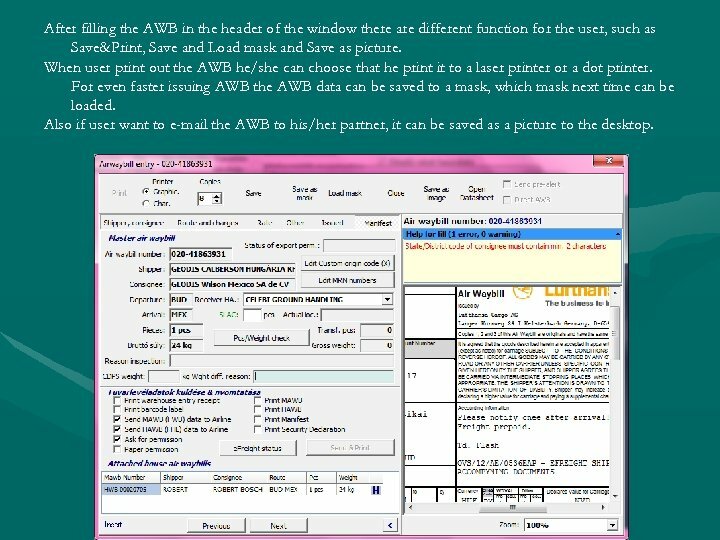 After filling the AWB in the header of the window there are different function for the user, such as Save&Print, Save and Load mask and Save as picture. When user print out the AWB he/she can choose that he print it to a laser printer or a dot printer. For even faster issuing AWB the AWB data can be saved to a mask, which mask next time can be loaded. 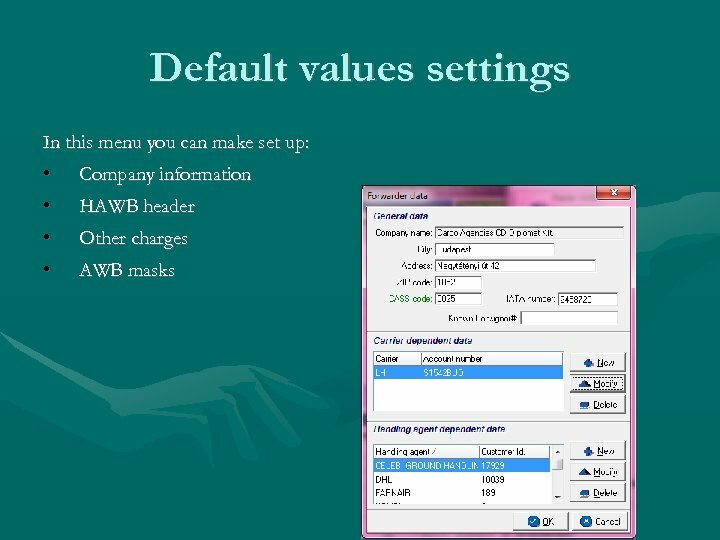 Also if user want to e-mail the AWB to his/her partner, it can be saved as a picture to the desktop. 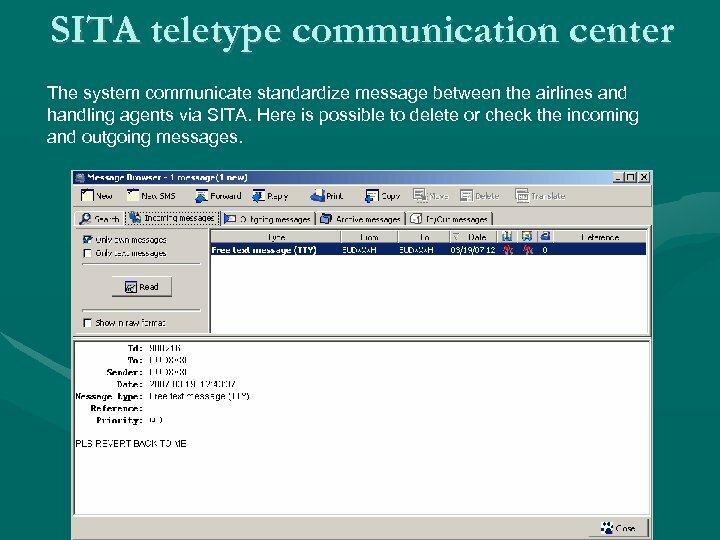 SITA teletype communication center The system communicate standardize message between the airlines and handling agents via SITA. Here is possible to delete or check the incoming and outgoing messages.